Perfect for the coffee table and blends well with our furnishings! It looks much heavier than it is, which is quite nice actually (not prone to scratching the wood). I really like it. 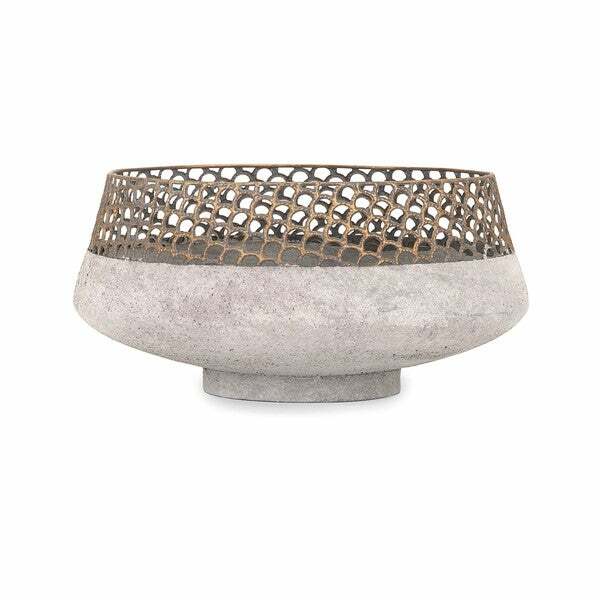 Vanilla Rings Round Centerpiece 12.5"x4"
A honeycomb of lacey fretwork surrounds a metal bowl for any airy look that is simply bee-utiful. Me and my daughter went to look at model homes, which is something we love to do on the weekend, and guess what we saw, my metal bowl. It made we feel so good that I purchase something that was used in a model home. I love this bowl and can't wait to decorate it. Great buy. Okay - doesn't look bad - but kind of cheap looking. Bowl was received damaged, but poorly made, very light weight and very cheap looking in person. The lace top had chunks here and there making a very messy look. Bottom is just gray looking, doesn't look like that "stone" look you see in the picture at all. I am returning the bowl. I recently placed an order for this bowl thinking it would give a once look to my farm house themed kitchen. When I received it; I wasn't as impressed at is in person, as I was online. The hoops on top were not "melted" together well so if you have a small child (like myself), I was worried about possibly getting cut, if picked up wrong. Also the bowl wasn't as sturdy/heavy as it would seem to be online. Giving it a cheaper look in person than it looks online. Another reason I reconsider this was, if you are planning/looking for something that would contain fruits, veggies, or anything eatable this piece was made of products that are known to cause cancer in the state of CA. This bowl is gorgeous!! Though, it is a little bigger than what I had Imagined, it still looks amazing and is a wonderful conversation piece. Nice and big. Love the shape. The color is off. It’s very dark on the bottom. Doesn’t look like the photo. The top is also quite dark. Not as bright and shimmering as the photo. Matches the taller vase I purchased.